OWNERS ARE MOTIVATED! 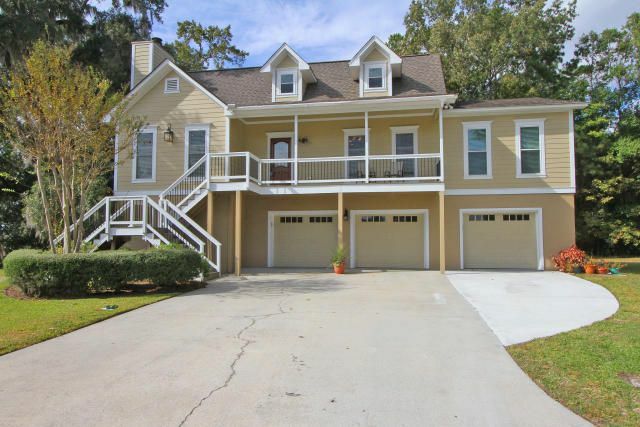 True deep water home with floating dock and amazing views of the Ashley River from Charleston to the Plantations! This impeccably cared for raised level home has it all. Large spacious and open living, a chef's delight gourmet kitchen with upscale appliances and granite counters. Recently renovated in wonderful taste. Hardwood floors throughout the main living area with master on the main with an elegant master bath with separate waterfall tub and shower..a walk in closet you can lose yourself in!!! An additional bedroom and large laundry room on main floor as well. Lovely and bright great room with fireplace and bright sunroom for enjoying the river views. Upstairs has an additional two bedrooms and full bath. The mother in law suite on the lower level is the 5th bedroom. The best part of this home is the outside living space. Large expansive yard for fun and games. Lots of woods and privacy but the best is the sort walk out the dock that leads to the boat lift and floating dock. Get ready to boat to just about anywhere along the Ashley or just bring a chair and sit, relax and enjoy! The views are fabulous!!! Don't miss seeing this home, it is top of the line all the way and convenient to everything, minutes from the airport, the outlet mall and easy access to all the interstate highways.. Don't mess with traffic to get to the water, have it right in the middle of your lifestyle!